Parking meters are the latest urban structures to go the way of payphone and newspaper boxes. The coin-operated ones were the first to go, replaced by the efficiency of multi-space meters. Now those are disappearing, replaced by a range of parking payment apps. From the city’s point of view, when the same service can be done with a smartphone, why keep the machines in the city? There are quite a few reasons. Open up any of the multi-space machines, and inside you will find a networked computer, a payment processing system, a printer, and input and output mechanisms – all solar powered. That’s a lot of ability that was already underutilized to simply issue bits of time on a piece of paper, say nothing of the wasted potential in ripping them out of the streets and piling them in a warehouse. Designer Mayo Nissen was one of the first people to recognize the untapped potential within multi-space meters. His City Tickets initiative, begun in Copenhagen in 2010, years before the large-scale demise of the machines began, harnesses the full potential of the technology contained in the meters to turn them into dynamic, responsive system, allowing a two-way exchange between the city and citizen. 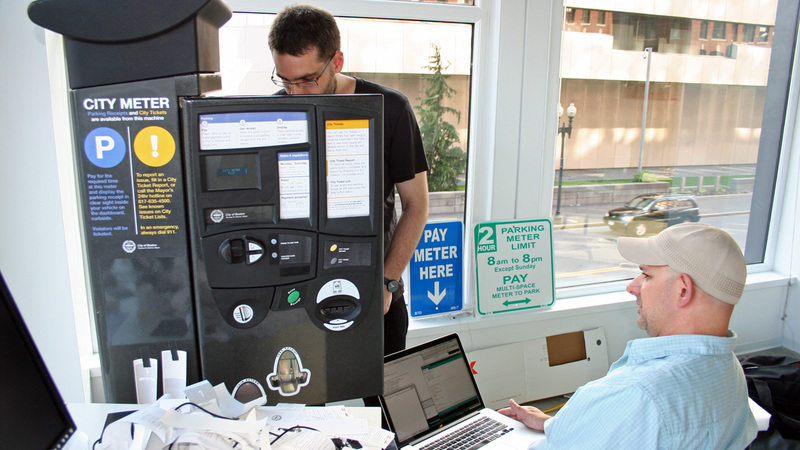 As well as parking receipts, the repurposed meters dispense City Ticket Lists, a list of known issues in the vicinity of the meter that have been reported to the City, and a response from the city as to how each one is being addressed. Also available are City Ticket Reports, an opportunity for passersby to submit issues or make suggestions for improving the immediate area around the meter. This project and dozens of others are featured in the Reprogramming the City Book!